This might be a “just me” thing. I’m not sure. But at 25 months of veganism, I’m realizing that I live in a vegan bubble. What I mean by that is, my family knows I’m vegan, my friends know I’m vegan, even many of my acquaintances know I’m vegan. I know where to eat, where to shop, what stuff I can buy at the grocery store. I’m so deep into the bubble that when something comes up where I’m asked to meet some friends at a restaurant that has absolutely nothing for me to eat, it’s shocking. Oh yeah, the rest of the world eats animal stuff. They eat it without thinking about it. The world hasn’t really changed at all, just my one-sevenbillionth of it. Don’t they see? Don’t they get it? How can they keep going about their business and be so happy and miss this giant issue completely? That’s what I mean by the bubble. I forget that even though some days it feels like veganism has caught fire in the last year, it’s not even a brush fire, or even a kitchen fire. It’s a flare-up in a pot. Maybe. But these relatives started treating me like I was clinically insane. Why would you do this? Why would anyone place restraints on themselves that they didn’t have to place? Nevermind that some of these relatives are religious, and place restraints on themselves that they don’t have to place, they don’t see it that way. It’s certainly not the same thing! That makes sense! And it’s part of their heritage! So when we go to a restaurant with a million menu choices BUT NOT A SINGLE THING I CAN EAT, and I have to ask the server if the kitchen would be willing to make me an avocado, lettuce and tomato sandwich on rye since I see that all those items are on the menu, these family members look at me like: Why would anyone do this?!?!?! I live in a bubble. These relatives are the real Americans, not me. These relatives are the real humans, not me. I am an oddball. Living in a bubble. ← Aren’t you sick of vegans? I totally understand how you feel. 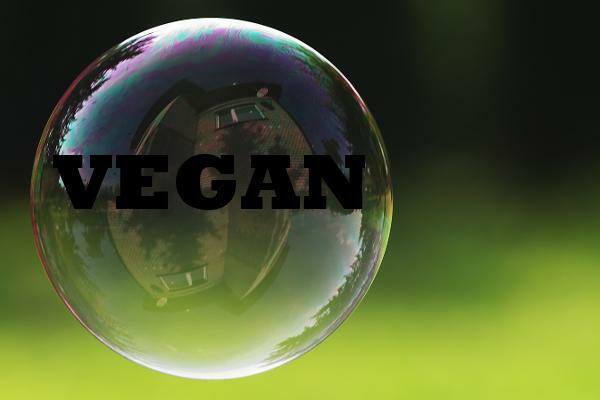 But even though vegans are still the minority despite the many victories on the vegan front, I think it’s the non-vegans that live in a bubble. A much larger bubble, but a bubble nonetheless. They have heard about the suffering that animals go through. They have heard of the environmental and health impacts of eating meat. They have eaten meat for generations so surely that can’t be bad. So why would they question the norm? Why now? Why wouldn’t they stay in their bubble where they’re comfortable? I have this conversation with a really close friend of mine every so often, actually. We’ve determined that most people just tend to accept things for what they are, whether it’s about eating meat, GMOs or airport scanners. I realize that some of them just don’t have the physical, mental or financial capacity to go off of the norm. But I think that if people really want to change, they will do it and they will try to make it work. That’s what you and me and the other vegans out there did. This is a great comment, and it makes me feel stupid because I should have realized this and ended my post with it. You are totally right!